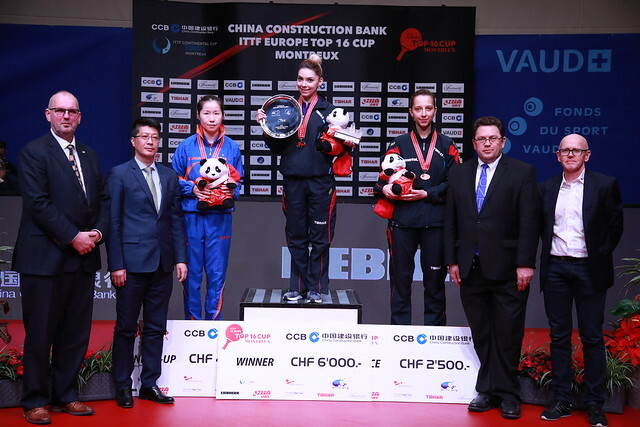 Champion in 2017, Dimitrij Ovtcharov made the trip to the Swiss city of Montreux earlier this month looking to defend his title at the China Construction Bank 2018 ITTF-Europe Top 16 Cup and now the German star has reflected on his personal outing at the two-day event. Seeded first for the Men’s Singles competition, Dimitrij Ovtcharov won three matches on his way to the gold medal contest before facing fellow countryman Timo Boll for the trophy. While Ovtcharov missed out on winning a fourth consecutive title at the Europe Top 16 Cup, the 29-year-old had nothing but praise for Boll and is determined to come back stronger in 2018. In the Round of 16 the host nation’s very own Lionel Weber provided the opposition for Ovtcharov – a player who, the German admits, surprised him and believes can develop into a Swiss Great if he continues to work hard at his game. Ovtcharov enjoyed one of his strongest years on the international circuit in 2017 with four Men’s Singles titles on the ITTF World Tour, a first position finish at the Liebherr 2017 ITTF-Men’s World Cup and a silver medal at the Seamaster 2017 ITTF World Tour Grand Finals. Proud of his achievements over the past year, Ovtcharov is hoping for more reasons to cheer in the year ahead.